A period of illness had forced me of this project but now I'm back on the case. As previously mentioned my TR4 has been "restored" by someone else but not tremendously well! 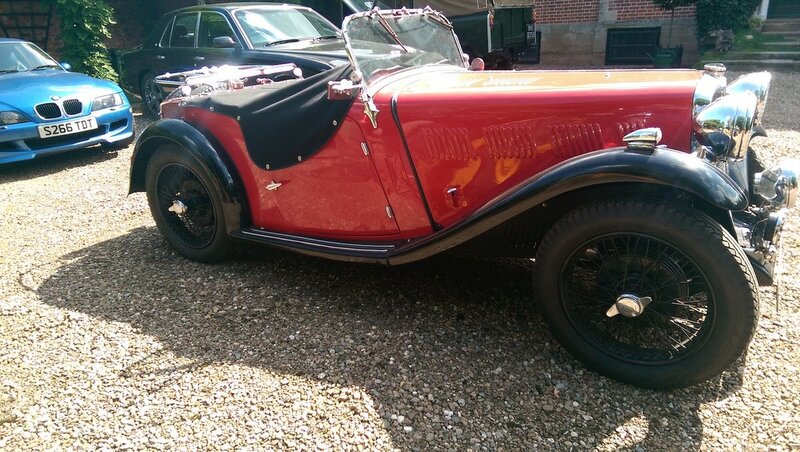 The previous owner supplied a photographic record of the restoration, which indicate that he acquired this car as a chassis, body shell and boxes of parts. I thought the car was sitting low on the front as the tyres were only just clearing the outer wing, especially on the left (nearside in UK) and the wheel was positioned about 15 mm proud of the wing. A check of the chassis dimensions using the method shown in the workshop manual, I determined the chassis was within acceptable tolerances but the body was fitted about 8mm out of square. The front wheel camber is correct so I measured the front track width and found this to be 1550 mm and according to the manual this should be 1453.7mm. It is therefore possible that an earlier owner has widened the front track. The upper and lower wishbones look to be genuine Triumph but the lower wishbone is about 25mm longer than the measurement shown in the manual. I didn't have a measurement for the upper wishbone but as the camber is correct, I assume this must be longer too. The fixing points for the wishbones appear to be in the correct place . 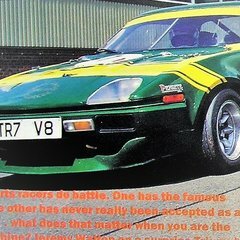 Does anyone know of another Triumph car (or other make for that matter) fitted with longer wishbones that could be fitted to a TR4 to widen the track? Give us a clue, only half the info there, to save me checking my books where is the track width being measured to ? Also what wheel and tyres sizes are fitted ? are you on spoke wheels ? I take it there's obviously no spacers behind wheels etc. I can't see why anybody would increase the tracking of the car, maybe if they had a misguided attempt for what they think is "go faster" purposes. Body offset is pretty common and more noticeable if oversize wheels or tyres are fitted. Wire wheels give you a bit more track than steels. On my TR4 with 72 spoke 5 1/2” wheels and 165 tyres the tyre side walls sit proud of the arches on the front and near flush at the rear. With standard wheels the offset wasn’t noticeable. Take notice of other cars when you see them. Not many are centred. I know of a couple of people who run spacers on one side of the car to even things out. Spoked wheels fitted with 165/80-R15 tyres. The track was measured (as shown in manual) from outside of the spoked wheel retainers, there are no wheel spacers fitted. Some owners of all sorts of vehicles widen track for a variety of reasons and it was certainly very common in the 60s and even later, when flared arches were much the rage. Interesting comment from Drewmotty because I did not realise that the tyres normally protrude slightly which means that the track may be correct despite the variation from the measurement given in the manual and there is also the matter of the lower wishbone length, which also varies from the measurement given in the manual, this remains a mystery. Also, as I mentioned initially, this car appears to be sitting very low and the tyres only clear the wing lip by a few mm on the left and a little more on the right. In an apparent attempt to correct this, the "restorer" had added thick spacers (up to 24mm thick) between the front half of the body and the chassis, thicker on the left than the right - now removed. I am now wondering if the springs are shot or the 'restorer' has forgotten to put the distance pieces on top of the springs but I can't check this until I get to the car tomorrow. Do you know what the clearance between the tyre and wing lip should be? or better, the ride height to wing lip. The manual is not particularly helpful in this regard because it only gives the ride height measurement to the top of the steel roof, which I don't have. Are the bottom wishbones fitted the correct way up. Ie with the beam centre line above the centres of the pivots? When inverted they will lower the front end considerably. David....Some pics would be helpful. If the lower wishbone is longer, there should be some evidence of extension by way of welding or similar. Correct camber is debatable...What is the camber on your car? Could be the PO wanted to go negative camber, as most cars have too much positive camber when at factory ride height. We are assuming correct size wheels and tyres. 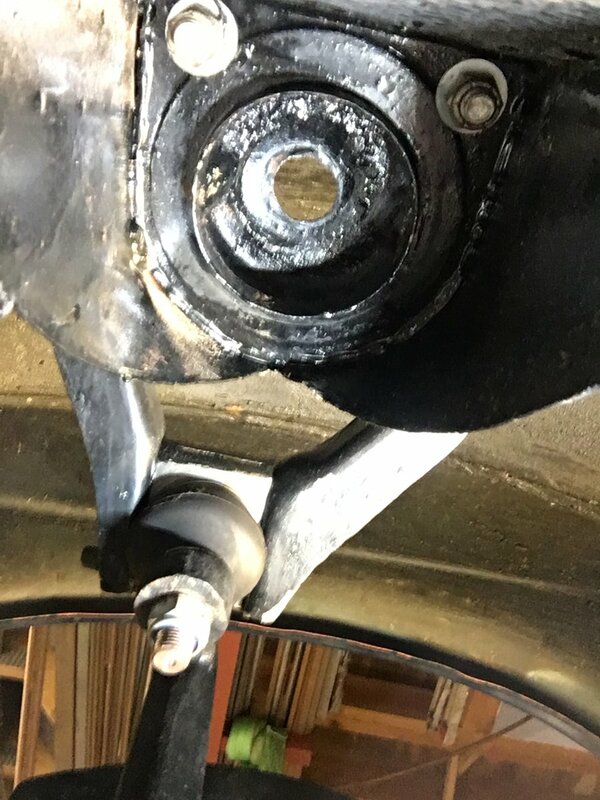 If you do not have enough clearance between the top of the tyre and the top of the wheel arch then start by either adding a spring spacer of the desired thickness [ if missing ] as you have mentioned, or replace the springs, but do not use over rated springs as the ride will be too harsh. There is a fine line between desired ride height, comfort and camber. 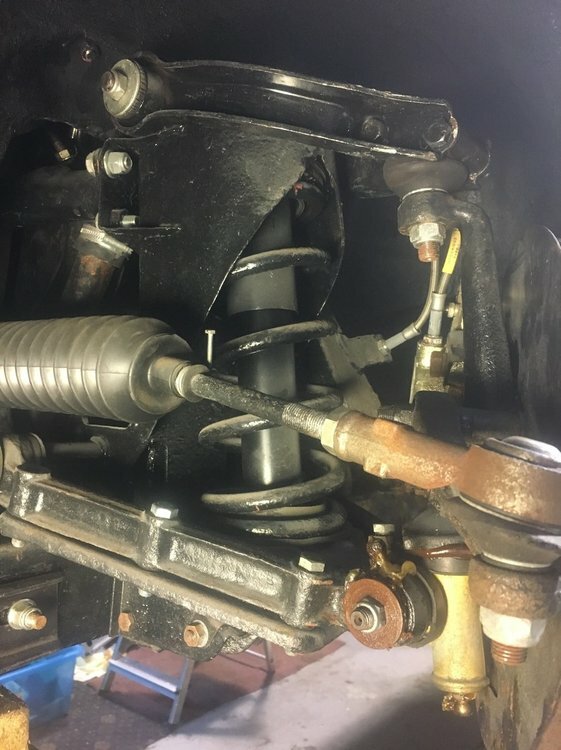 Measure the track of your rear axle and see if it is a similar amount wider than shown in the Workshop manual and equates to the increase in track on the front. Then sit down and count how many spokes there are on your wheels and take one off and measure it's width and the offset. If it's a 72 spoke wheel I wonder if they are centre laced spokes with wider rims as per the Drewmotty post. I wonder if you are checking track width across the bottom of the tyres instead of the rims, so including the bulge in the tyre? Also, as previously mentioned if you have spoked or non-standard rims that would account for some of the width. Tracking, if it’s toeing out too much could also make a difference if measured across the front? You're spot on Drewmotty, the bottom wishbones are indeed upside down! Thank you. I'll correct the error tomorrow. The lower wishbones have not been welded, however, I measured along the length of the wishbone arm itself but the measurement in the manual is actually between two parallel extended centres of the fulcrum bushes, which explains the apparent difference I found. The wheels have 60 spokes and are 5.5 inches wide, the inside edge of the hub is in line with the rim centre line. The rear axle width is only 10mm greater than the size given in manual. The camber is 0.75 degrees on the left and 0.25 on the right which appears to be closer the specification for a TR4A rather than a TR4. Kevin, I measured the track as per diagram shown in manual i.e. between the outer most surface of the wheel retainers. The wheels are non standard, the dimensions shown in the WSM are with the standard wheels not the 5.5j, but that size is fine and takes the 165 tyres nicely, hence your wider than normal track now we have established a measuring error on the wishbones on the front. My investigations into the suspension have revealed couple of other worrying things but I will ask advice on these in separate posts where I am sure I will receive the same excellent quality information. 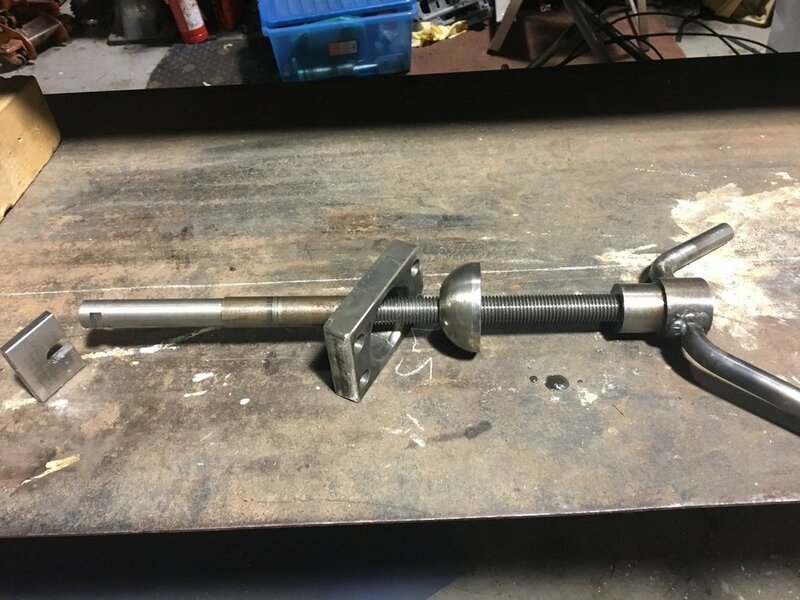 I am just about to make a spring compressor.I know I could use "allthread" but I haven't cut threads on my lathe for a few years now so the practice will be welcome! I notice that the spring compressor shown in the manual has an articulation at the top end and whilst I can replicate that, I can't immediately see it's purpose, does anyone know it's purpose? Is it a universal compressor for various other Triumph models where the articulation is required? The articulation is to account for the springpan being wishbone mounted and hence swinging through arcs like the upper arms do. Many people find it easier to account for the articulation on the bottom of the threaded rod using a largish ball arrangement (large track rod end chopped off ? or the like) with a hole drilled through it allowing a radial accommodation of movement whilst still restricting the spring pan via washers and loose plate. As comforting as it is to manufacture specialist tools for various purposes I try not to end up with a toolbox filled with one off specialisations or replicate Churchill and Co with wholesale tool manufacture. Many of my tools are stripped for other functions and have attachments added to multiply their variety of uses, ie a heavy duty liner puller complete with locating alloy liner spigot drawing plug is stripped and reassembled with suitable accoutrements for other purposes where a central pull for extraction is used. Thank you Mick for your much valued input. When I measured up for the spring compressor I realised the reason for the articulation and machined a hemispherical thrust washer which probably performs like the modified track rod end you mentioned, if I understood you correctly. I understand entirely what you say about a box full of "specialist tools" and I also do a similar thing to you, for example, I use a couple of different hydraulic pullers as the main "engine" and have made various attachments for an assortment of different pulling or pushing jobs. The only real "made-for-the-job" tools I have are for work on performance Jaguars, which has been the bulk of my work to date. I've now removed one of the springs but there was no loose distance piece on top of the spring, the rubber collar simply engaged on the shaped part which is welded into the spring abutment bracket (see image). Does anyone have the dimensions of the distance pieces please. Do you intend using the same springs...if so, try 1" thick spacer first to see how that effects the camber and ride height. Your reply implies that there are different sized distant pieces but I can only find one listed so maybe there are after-market versions available. The existing springs are within specification so I will use them. By scaling the photographs in the Manual, I estimate the spacers to be something over 1.125 inches but I cannot really tell how much of the distance piece is hidden up inside the abutment bracket. I'm not sure how much higher the body will be when the suspension is reassembled with the lower wishbones the correct way round but I think I will make the distance pieces 1.25 inches and try that, if it's too high, I will remove them and turn them down accordingly, It's easier to take material off! David - your "home made" spring compressor is even beefier than my original Churchill version, which I acquired several decades ago! Well done - with the energy locked-up in the compressed spring, it's important to have the right tool for the job so as to be safe. My close friend who is a professional vehicle body/chassis repairer had his forearm broken when a road spring broke loose from a compressor. I assume you are aware of the spacer design so that the spring is retained. I had some made out of alloy. Do not assume that you will require the same height spacer for both sides. One side may be different as there are a few variables. Unless you know for sure what springs are fitted, I would get a pair of new ones so that you know what you are starting with. Only then would I be looking at adding any kind of spacer - these may be needed, but unless you have springs that you know are the right length, strength and un-sagged you may be adding a band-aid to a fixable problem. Thank you for your advice Tim but I'm now a little confused when it comes to spacers. I have to confess that I have had no experience with rebuilding Triumph vehicles, although I have restored and rebuilt many classic cars. As you will see from my previous posts the car was sitting too low at the front and the previous owner (who ostensibly restored the car) had not only refitted the wishbones upside down but he had not fitted the distance pieces above the springs (as shown in the workshop manual and various parts diagrams provided by online spares suppliers), therefore I am not fitting additional spacers but merely making and fitting the distance pieces that should be there ex works - or should they? The existing springs are within factory spec. Early cars (TR2-3, & possibly 4) were fitted with "short" front springs, which required an alloy spacer to be placed above it to give the correct ride height. Later the spacer was deleted, & a longer spring was used. these spacers were approx 50-60mm long. It was not normal to have to have lengths other than that. see items 68 & 70 note two versions of item 68 one with, & one without spacer. springs are the longer ones, so having just finished making the distance pieces, I now don't need them! Now I've got the lower wishbones the correct way around, I'll reassemble the suspension and see if that corrects the problem. Yes, they are quite similar ! I think that if later vertical links (4A to 6) are fitted then the ride height will be too low. Just a possibility. I've found several things not quite right (in some cases, very wrong!) with this car, so anything is possible! How would I tell the difference between the vertical links for TR4 and 4A. I've now got the car back on it's wheels and am pleased to find that the ride height has increased considerably but I still don't know what it should be using standard tyres on wires when measured from floor to wheel arch lip when measured through the centre line of the wheel. Do you, or anyone else know please?